We humans have used technology to become masters of communication. But we are far from the only species with an impressive array of “superhuman” abilities. Butterflies have unique features they use for socializing, mating, warding off predators, and more! Consider the butterfly’s ability to see ultraviolet light. UV light is a spectrum of light between 10 and 400 nanometers that humans and most other animals cannot sense. Butterflies have complex mechanisms for both receiving and sending UV light, and they use these amazing gifts in a variety of clever ways. One well-known phenomenon is the relationship between butterflies and nectar-producing flowers. 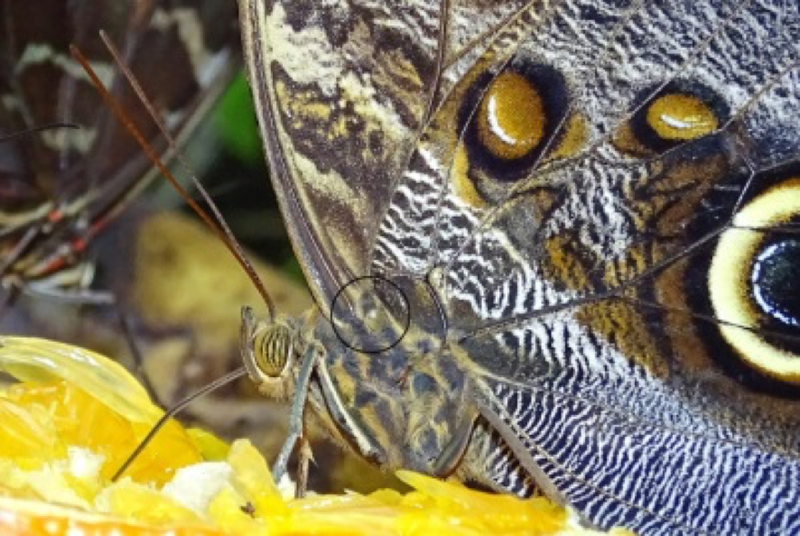 Thanks to special photoreceptors in their huge compound eyes, butterflies can detect ultraviolet light. Many flowers have evolved to display ultraviolet patterning that helps lead the butterflies directly to their nectaries, resulting in a mutually beneficial exchange—nectar for the butterfly, pollination for the flower. These patterns can resemble airport landing strips or helicopter pads, advertising, “The food is in here!” The butterflies easily hone in on these markings and land on the flower petals. From there, another unique ability helps to ensure the butterflies find what they’re looking for. A chemoreceptor is a sensory cell or organ responsive to chemical stimuli. Butterfly wing scales as seen under a microscope. Photo credit: Thomas Eisner. 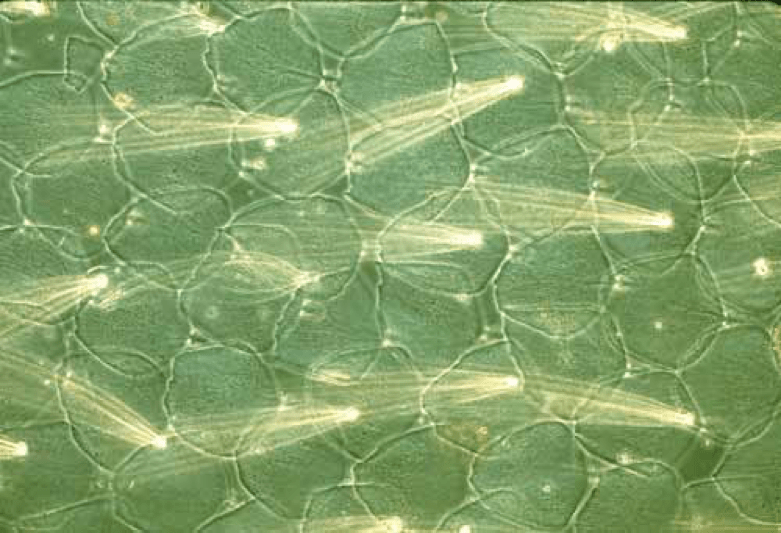 Learn more about butterfly scales from his post, Scales: On the Wings of Butterflies and Moths. Some people will be surprised to learn that in addition to sensing ultraviolet light, butterflies can also emit ultraviolet light waves through their wings. Their wings are coated with minuscule scales that can reflect different color spectrums, depending on their shape and the angle of light that hits them. As the angle of sunlight shifts, the colors emitted from these scales shift. This is how visitors can watch our butterflies “change color” as they flap their wings and flutter about. The structure of these scales reflects many wavelengths of light that we perceive as brilliant colors, but the scales also reflect UV waves, which other butterflies can pick up on for communication. 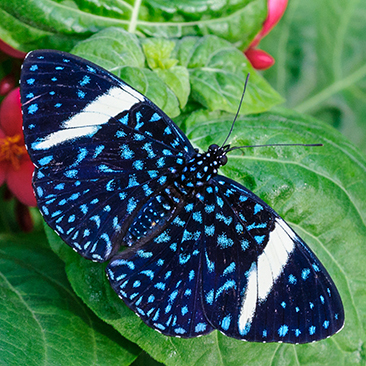 Since butterflies have many predators, being able to send and receive discrete messages in the form of UV light ensures they won’t be detected. This is often used as a secretive means of courtship. Think of it as two naval ships using their flashing beacons to silently communicate without being detected by enemies. Alternatively, think of it like online dating. 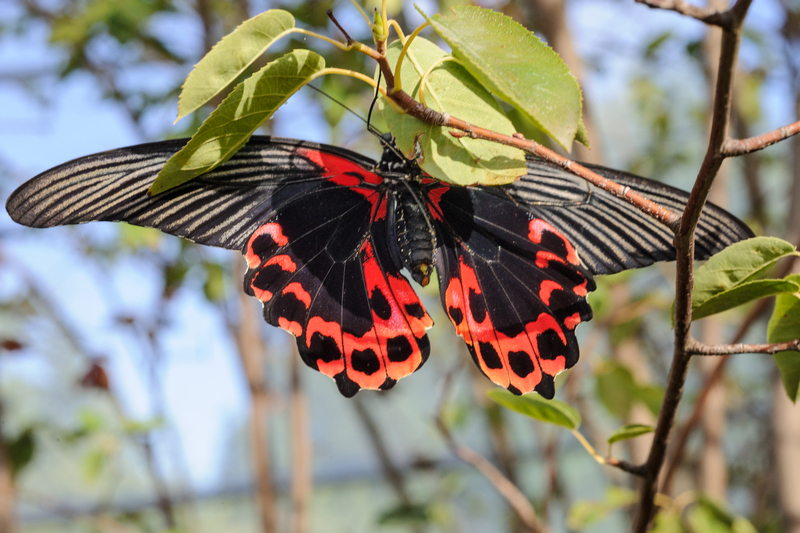 Male butterflies will pick up on the vivid UV patterning of a female, and begin their courtship rituals. The female will check out the UV patterning of the male to decide if he has the right stuff. If he does not, she will assume a posture that I described in my previous post, that is, lifting her wings and abdomen. What I didn’t know earlier was that by lifting her wings, the female effectively covers up the UV light that attracted the male in the first place, causing him to lose interest and leave. I guess things haven’t changed much in the last six million years! Vogel’s Organ is thought to be used for hearing birds flap their wings. Photo credit: Ray Cannon. Read more about it in Ray Cannon’s Nature Notes. As if ultraviolet-manipulation abilities weren’t enough, did you know that our blue morpho and giant owl butterflies have vestigial ears? Called “Vogel’s Organs,” they use these sense receptors to detect birds. Our cracker butterflies (Hamadryas sp.) can use these organs to sense—and create—ultrasonic sound waves to evade bats. What’s more, we have butterflies that can turn the table on their predators by scaring them off using markings that look identical to snakeheads and giant eyeballs! Stay tuned for the next installment of news from Butterflies & Blooms—the evolutionary war of super-senses and abilities among butterflies continues.